Ephraim Claybourn – probably named after his uncle Ephraim – was born on 7 December 1788, and because we know his father Joshua lived in North Carolina at the time, it is likely that Ephraim was born there as well. Either way, Ephraim lived in Knox County, Tennessee (eastern Tennessee) at the time of his marriage on 21 December 1809, to Mary (called Polly) Browning. [Mary Browning (“Polly”) was born on 11 November 1792.] We know the marriage date from a pension record attested by the Rev. John McCampbell of Maryville, Blount County, who married them. Ephraim was twenty-one and Polly seventeen. Click here to learn more about the historical and cultural context in which this young couple lived. 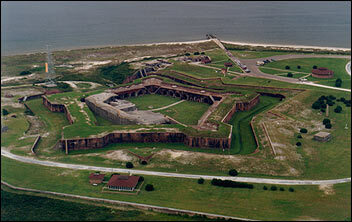 Fort Morgan, pictured here, was built over the site of Fort Bowyer on Mobile Bay. Fort Bowyer was constructed during the War of 1812 and may have been the one Ephraim helped erect. Nearly five years after their marriage Ephraim left to fight in the “War of 1812,” although his actual service lasted from 13 November 1814 to 5 June 1815. He was a member of the 5th Regiment of the East Tennessee Militia in Captain John Reeves’ Company, which was under Colonel Edwin Booth’s direction. [Tom Kanon, “Regimental Histories of Tennessee Units During the War of 1812,” Tennessee State Library and Archives, accessed 24 October 2014, http://www.tennessee.gov/tsla/history/military/1812reg.htm.] On his record from the Adjutant General’s Office, the name is spelled “Clayborn”. Along with the Third and Fourth Regiments, this regiment was part of the division under the command of Major General William Carroll. These units were sent to the Mobile, Alabama, vicinity to protect that region from Native American and/or British offensive activities. The regiment was organized at Knoxville and their line of march took them to Lookout Mountain (present-day Chattanooga), to Fort Strother, and finally to Mobile.[Ibid.] When news of peace arrived on 17 Aprill 1815 Ephraim was helping erect a fort on Mobile Bay. Mary E. Lones was born on 22 September 1827 in Knox County, Tennessee, never married, and as of the 1880 census she was living with her widowed mother in the household of her brother Henry in Allen County, Kentucky. Samuel R. Lones was born on 7 January 1830 in Knox County, Tennesse. He married a woman named Charlotte (1821-1894) on 24 March 1858 in Knox County, Tennessee, and they had three children. Samuel served for the Union in the American Civil War as a corporal in Company D of the 6th Tennessee Infantry Regiment. Samuel died on 9 December 1888 in Reynolds County, Missouri. 18 October 1877 and they had six children. Henry died on 3 March 1911 in Allen County, Kentucky. James S. Lones was born on 15 May 1834 in Knox County, Tennessee. He married in about 1854 to Martha E. Claiborne (1831 – c. 1906), the daughter of Ephraim and Polly Claybourn (discussed below). They had four children. James died on 16 March 1904 in Macon County, Tennessee. Harriette Threlkeld corresponded with a J.Y. Lones in 1936, the Cashier of the People’s State Bank in Scottsville, Kentucky, and nephew to James and Martha (Claiborne) Lones. [Verner M. Claybourn and Harriette Pinnell Threlkeld, The Claybourn Family (A-1 Business Service, 1959), citing a letter to William Divine Claybourn.] J.Y.’s mother was 80 years old at the time of their correspondence. J.Y.’s mother knew Polly Claybourn and attended her “burying,” attesting to the fact that Polly and Ephraim were buried, though in unmarked graves, beside Lutecia and David Lones. She stated that Polly died in 1874 to the best of her recollection, and that tallies with the pension record. DeKalb County was formed around 1837-1838 from land in Cannon, Warren and White Counties. Historian Will T. Hale believes that the first settlers in the county were at Liberty and came from Maryland in 1797. [Will T. Hale, History of Dekalb County, TN (Nashville: P. Hunter, 1915; repr., McMinnville: B. Lomond Press, 1969), 254.] If so, Adam Dale was the first settler. He may have come over the Cumberland Mountains, although some sources claim he came down the Ohio, up the Cumberland to Nashville, and then overland about 56 miles.[Ibid.] It was almost primeval forest. A middle Tennessee land office was opened in 1783. An early settler was Lemual H. Bethel and later a Dr. Tilman Bethel. Bethel appears as a family name among the Claybourns so it may have been because of this early day doctor. Jim Crook is named as a wagon maker, and a John Parker of Dismal Creek is named in describing the unusually large men of the county. Men of those names married Claybourn women. Dismal appears as a surname, and in a visit to Liberty in 1936 Harriette Threlkeld passed through a crossroads store settlement named Dismal. In the 1840 census of DeKalb County, Tennessee, Ephraim and Polly were still listed as living there along with their four youngest children. [1840 United States Census, DeKalb County, Tennessee, accessed through Ancestry.com.] Not long before that census was taken William Divine Claybourn, the second son, left Tennessee for Illinois. By 3 July 1848 Ephraim and Polly had also left Tennessee and bought 58 acres of land in Allen County, Kentucky, near Puncheon Camp Creek for $60 cash from Joseph Stinson. This creek empties into the Barren River a short distance from the Tennessee state line. The nearest post office is Fountain Run in Monroe County, but the nearest larger town is Scottsville, Kentucky. To reach this farm by automobile, one must go south from Scottsville, Kentucky, to Haysville, Tennessee. Going east from there you would take every turn to the left up towards Roark Graveyard – back up into Kentucky. It is very hilly and the roads were not good in 1936, but the place is known locally as the Claybourn farm, and a James Claybourn lived on it then. His father was Alfred; his grandfather was Andy. Although the land apparently stayed with the family, Ephraim and Polly did not own it long. In 1849, roughly a year after buying the land, Ephraim sold the farm in Kentucky and went to Illinois to visit his son William Divine Claybourn. Polly returned to visit in DeKalb County several times after she and Ephraim had left it, but it is not known whether Ephraim did as well. Ephraim died on 11 May 1850 in Allen County, Kentucky. Since he is buried on this same Kentucky farm, it was presumably owned by relatives. 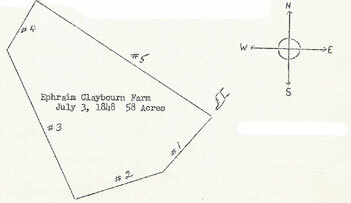 The James Claybourn whom Harriette met in 1936 referred to “Aunt Polly” living on the farm, and she too was buried there. Harriette later relocated the farm and the grave in 1976, owned then by Arnold Stinson. On 14 November 1871, Polly applied for a pension for Ephraim’s service in the War of 1812. She was granted $8 a month on 13 July 1872. She cashed her last pension check on 16 December 1874. The pension paper is headed, “Claiborne, Polly”.[Ibid.] The first line reads, “Polly Claibourn declares herself to be the widow of Ephraim Claybourn.” His death and burial are attested by Milender and Sally Claiborn, citizens of Macon County, Tennessee, which is just over the county line. The last line says, “Ephraim Clayborne died 11 May 1850, in Allen County, Kentucky.” Note the various spellings of the name used even in the same document. Polly visited William Divine Claybourn in Illinois after the Civil War. William Divine remembered her as “a very tidy, sprightly woman”.[Ibid.] She would have been 73 in 1865. Polly died in 1874. Sarah W. Claybourn was born on 3 February 1811 in Knoxville, Tennessee. She married John Parker (born in 1812 in Knoxville, Tennessee) and together they had several children. By 1860 the family was living in VanBuren County, Arkansas, but by 1870 the family was back in DeKalb County, Tennessee. Sarah died before March 1875 when her husband married again in DeKalb County. Martha E. Parker was born in about 1832. She was unmarried as of the 1880 census. Ephraim M. Parker was born in about 1837. Mary Ann Parker was born on 7 September 1838. She married Washington E. Roberts (21 December 1837 – 6 December 1924) on 28 January 1858 and together they lived in VanBuren County, Arkansas, Dekalb County, Tennessee, and Allen County, Kentucky. [Kentucky Birth, Marriage and Death Records – Microfilm (1852-1910). Microfilm rolls #994027-994058. Kentucky Department for Libraries and Archives, Frankfort, Kentucky.] They had eleven children in all, three dying as infants. [Those children included Mary Isabelle Roberts (13 December 1873 – 19 July 1942) and a son, Lovell H. Roberts, born on 4 January 1868 in DeKalb County, Tennessee. In a second marriage for both in early 1910, he married Eliza Jane Lones, daughter of Martha E. Claiborne (1831 – c. 1906) and James S. Lones (1834-1904). Per Eliza’s Kentucky death certificate, she was born on 15 September 1866 and died on 31 December 1932 in Allen Co, KY, while her headstone in Haysville Cemetery in Macon County, Tennessee gives her date of birth as 15 March 1866 and death as 31 December 1931. Lovell died on 18 November 1945 in Allen County, Kentucky, and is buried in the same cemetery with his third wife, Harriet Lee Wallace Fishburn Roberts (1871-1948).] Mary Ann died on 2 April 1927 in Allen County, Kentucky, and is buried with her husband in Seward/Washington Roberts Graveyard in Allen County. Luticia Parker was born on 8 October 1842 and married John Sandlin (c. 1835-1890) on 8 October 1861 in DeKalb County, Tennesee, as his second wife. They had five children together. She married Manson B. Scott (1833-1913) on 17 May 1891 in DeKalb County as his second wife. Luticia died on 26 May 1912 in DeKalb County and is buried there in Dismal Cemetery. Almerinda F. Parker was born in about 1848 and married Matlock Roberts Jr. (c. 1832-1883), older brother of her sister’s husband Washington Roberts and a Union Civil War veteran. They married on 12 August 1866 in DeKalb County, Tennessee, and moved to Crittenden County, Kentucky, in about 1870. They had at least three children together. She submitted her widow’s pension claim from Tennessee and the 1890 veterans’ census information for him in DeKalb County. A family source says she died on 26 January 1908 in DeKalb County. Nancy Jane Parker was born on 12 January 1852 and married James Wesley Crook (1843-1919) on 21 November 1869 in DeKalb County, Tennessee, as his second wife. They had eleven children together, four of them dying as infants. Nancy died on 20 September 1895 in DeKalb County and is buried there in Dismal Cemetery. John B. Claiborne (click name for separate biographical sketch) was born on 30 December 1812. He moved to Little Rock, Ark., and suffered during the Civil War for holding Union sympathies in the South. Catherine E. Claybourn was born on 23 April 1815, and died on 16 August 1839, at the age of twenty-four. It is possible that she never married. Nancy J. Claiborne was born on 24 February 1817 and in about 1837 she married Thomas Taylor Bennett (born on 13 April 1812). They had at least seven children together. One child was a son, John Bennett, who was born in 1848. This son John married a woman named Permelia E. Sandlin in DeKalb County, Tennessee, and together they had at least six children. [1880 United States Census, District 1, Robertson County, Tennessee, accessed through Ancestry.com.] Nancy died on 8 August 1885 and Thomas died on 14 August 1886. Both are buried at Cummings Cemetery in Robertson County, Tennessee. Elijah C. Bennett was born in about 1838 and died after the 1850 census. Elizabeth Catherine “Eliza” Bennett was born in about 1840 and was unmarried and living with her parents as of the 1880 census. Mary Ann “Polly” Bennett was born on 9 April 1842 in DeKalb County, Tennessee. She married William Ira Scott (1840-1931) on 2 March 1862 in DeKalb County. They moved to Robertson County, Tennessee, and had ten children together, all living as of the 1900 and 1910 census when they lived in Simpson County, Kentucky. Polly died there on 14 October 1921 and is buried with her husband in John Meguiar Cemetery in Simpson County. Alice E. Bennett was born in about 1845 in DeKalb County, Tennessee, and was unmarried and living with her parents as of the 1880 census. Sarah Tennessee Bennett was born in about 1852 in DeKalb County, Tennessee. She married and on 28 July 1875 in Simpson County, Kentucky, to Wesley West (c. 1843 – 1918) as his second wife. They had three children together. She died on 10 December 1917 in Logan County, Kentucky. Fannie Bennett was born on 9 June 1855 in DeKalb County, Tennessee, and was unmarried and living with her parents as of the 1880 census. In the 1900 census, she is working as a household servant in Robertson County, Tennessee. Per Robertson County records, she died of tuberculosis on 7 September 1920 in the county poor house. She is buried there in Orlinda Methodist Church Cemetery. William Divine Claybourn (click name for separate biographical sketch) was born on 27 August 1819 in Knoxville, Tennessee. He moved to Illinois and he and his sons fought in the Union army. He died on 17 February 1896. James Thompson Clayborn (click name for separate biographical sketch) was born on 19 May 1822 in Knoxville, Tennessee. He lived most of his life at Liberty, Tennessee, where he died on 5 May 1900. Luticia Achea Claiborne (click name for separate biographical sketch) was born on 15 August 1824 and died on 22 Aug 1891. Mary Elizabeth Claiborne (click name for separate biographical sketch) was born on 11 May 1827 and died in about 1857. Martha E. Claiborne (click name for separate biographical sketch) was born on 13 March 1831.